Marrying advanced technology and old-world craftsmanship, Marathon creates cabinetry second to none. Every cut, corner and curve has a reason and a story. With 150 years of combined experience in cabinet design among the eight people on the cabinet design team and 19 people in the cabinetry department spanning 17-30 years of experience each, it’s no wonder that Marathon cabinet construction and installation has become functional art. 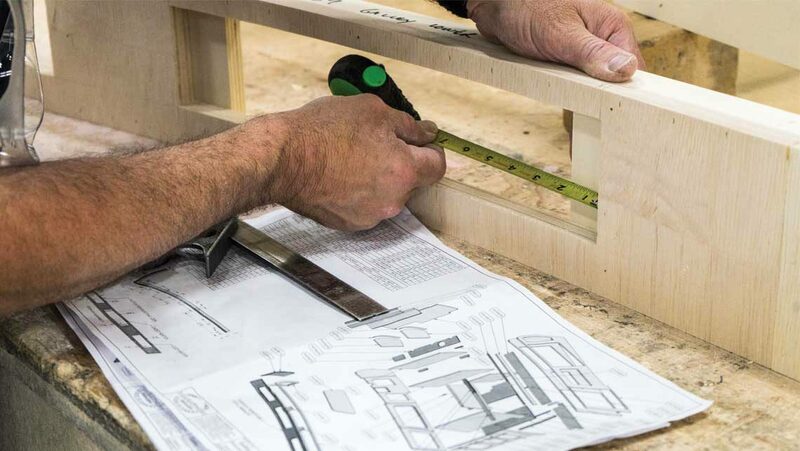 Our engineers and craftspeople have a true knack for creating cabinets that look simple but are designed for flawless performance day in and day out. At Marathon, we know that good design makes our daily lives easier and our luxury motorhomes better. As you reach for your wine glass, your shoes or your secret stash of chocolate, our goal is to ensure that ease of use and longevity of the beauty and functionality of your cabinets are as great in year 20 as in year one. a rear water closet that can be converted into a hanging clothes closet as necessary, continues to solidify Marathon’s place as industry leader. Modern materials usher you through the threshold to where beauty meets function in the case of a concealed refrigerator with no visible door pulls, plus a “hidden appliance kitchen” including dish drawer dishwasher, microwave and refrigerator concealed from sight with cabinet matching panels. Of course Marathon is driven by more than mere design, it’s driven by quality. Completely sufficient, yet undeniably graceful, Marathon stocks an extensive supply of cabinet hardware to use in all its varied installations so the optimum hardware can be used for each cabinet design. For instance, it stocks more than a dozen different door catches to ensure each door has the appropriate catch rather than indulging in a one-size-fits-all approach. Serviceability of components is also a priority in cabinet design. When applicable and possible, “toolless” fasteners are used on cabinet access panels for easy access by customers and service technicians to get to components for routine maintenance, trouble shooting or repair. Magnets, hook and loop (Velcro), snap fasteners, friction catches, hinged panels, etc. are all used. The faster that components can be accessed, and the faster a coach can go through our service departments for routine maintenance and repair, the sooner we can get our clients back to their lives of adventure. Whether you consider your Marathon your private five-star hotel, your rolling beach cottage or your full-time home, it’s a place where you strive to live your best days, be inspired, collaborate with the world at large, explore and share life’s adventures. We don’t take that lightly. That’s why our team is all about the details. a. Convertible coach: The galley and bathroom cabinetry sections were built on slides. The coach could convert to a private rear lounge by moving the two sofas in front of each section, sliding the galley and bath sections forward and placing the sofas to the rear to create the rear lounge. Even the pocket door moved with the two sections so the rear lounge could be private. j. Coach secrets: Multiple hidden storage compartments to hide firearms, liquor, etc.